1.5 cm. Courtesy Lawrie Shabibi and the artist. Lawrie Shabibi is pleased to present A Dish Fit for the Gods by Farhad Ahrarnia, his first solo at the gallery. A Dish Fit for the Gods juxtaposes ancient imagery, 20th-century modernism, hand-embroidered textiles depicting archival images of actors, spies and authors, metalwork and a new series of Khatam (Persian micro-mosaic) works. In the 20th century, the fever of Egypt worked its way into the arts, theatre and dance, architecture and literature, and the development of modernist projects. Ahrarnia explores the aesthetic outcome of these parallel sensibilities, wherein high modernism converges and entangles with the ancient, mythical and exotic. 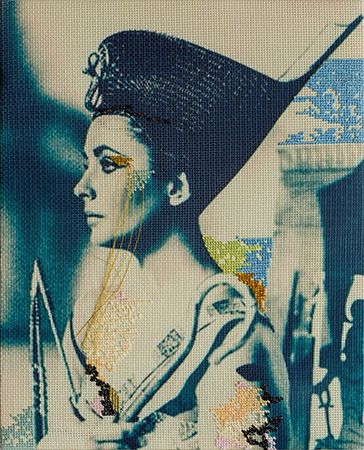 Ahrarnia’s new pictorial works are in two groups: large-scale images of dancers from the 1920s and 30s, dressed “Egyptian style” embroidered with patterns referencing the textile designs of Sonia Delauney; and more intimate portraits of named individuals from the 1910s–50s. By selecting these images of dancers and actresses in exotic attire from different decades, Ahrarnia traces the changing attitudes of acceptability throughout the first half of the 20th century, questioning notions of progress and liberalism in the Western world through time. In his embroidered portraits, Ahrarnia translates these notions into his own visual idiom—the coded language of espionage and mystery writing represented by the needlework cross-stitch. Ahrarnia’s love of anecdotal histories ties together various works. Agatha Christie, the subject of one of the portraits, wrote a number of her mysteries whilst stationed on archeological digs in Iraq with her husband Max Mallowan—most notably Nimrud, where they uncovered the famous Nimrud ivories. Motifs from these ivories (now in the British Museum), highly influenced by contemporary Egyptian artistic trends, are the subjects of Ahrarnia’s two silver-plated metal shovels from The Dig, Nimrud series. Finally, Ahrarnia’s Khatam works tie together Western European and American modernist works to Egyptian themes. With reworkings of Max Bill’s triangular compositions and Roy Lichtenstein’s Great Pyramid, he reverses the familiar flow of orientalism, emphasizing the engagement of the modern with the traditional, the decorative with the scientific, and the interflow between East and West. Farhad Ahrarnia (b. 1971, Shiraz) holds a degree in Experimental and Documentary Film Theory and Practice from the Northern Media School, Sheffield Hallam University, England. Ahrarnia’s solo shows include Stage on Fire, Rose Issa Projects, London, 2014; Canary in a Coal Mine, Rose Issa Projects, London, 2014; and Stitched, Leighton House Museum and Rose Issa Projects, London, 2008. Recent group shows include The Great Game, Iranian Pavilion, 56th Venice Biennale, Venice, 2015; Embroideremania, Hinterland Kunzt Art, Vienna Art Week, 2013; Bringing the War Home, Winchester School of Art, 2013; The Beginning of Thinking is Geometric, Maraya Art Centre and Barjeel foundation, Sharjah, 2013; Cometogether, Edge of Arabia, London, 2012; 6th Tashkent Biennale of Contemporary Art, 2011; and the Sheffield Pavilion at the 52nd Venice Biennale, 2007. His work is in the public collections of the Cartwright Hall Art Gallery, Bradford, Harewood House, Leeds and the British Museum, London. Lawrie Shabibi is a contemporary art gallery housed in Dubai’s Alserkal Avenue. The gallery supports the long-term development of the careers of young international contemporary artists with a focus on those from the Middle East and North Africa. The gallery has successfully introduced international artists to the region whilst at the same time presented Middle Eastern artists to the international contemporary arts community. By holding a regular programme of exhibitions, screenings and talks, publishing catalogues and participating in international art fairs, Lawrie Shabibi has been a forerunner in the development of the contemporary art scene in Dubai.